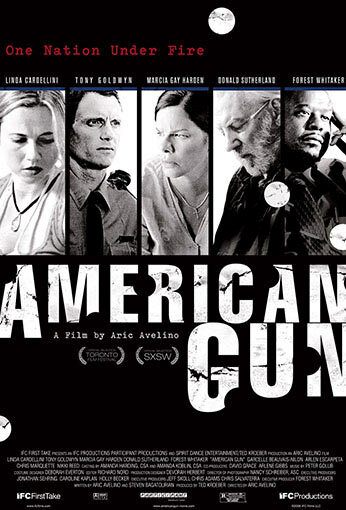 American Gun is a powerful series of interwoven storylines that bring to light how the proliferation of guns in America dramatically affect and shape the every day lives of its citizens. The film opens at the start of another day in a Virginia gun store, where owner Carl (Donald Sutherland), continues to sidestep controversy while running the shop he loves. His newest employee is his granddaughter Mary Ann (Linda Cardellini), a college student pressured to spend a semester in the family business. Despite her misgivings, curiosity overcomes her as she is slowly seduced by the weapons she sells. Across the country in Oregon, Janet (Marcia Gay Harden) is suffering through a television interview marking the third anniversary of her older son’s high school shooting rampage and suicide. As a single mother, she worries for her younger son David (Christopher Marquette) who is now the same age his brother was when he committed the terrible acts. While dealing with his own rage and grief, David quietly falls for Tally (Nikki Reed), the new girl in town. Meanwhile, Frank, a middle-aged deputy, watches the interview intently; still haunted by vicious accusations that he could have prevented the tragedy. On Chicago’s gritty west side, principal Carl (Forest Whitaker) struggles to keep his violent inner-city high school from self destructing. His wife Sara (Garcelle Beauvais-Nilon) desperately fears for the safety of their young son. When ace student Jay (Arlen Escarpeta) is caught hiding a handgun, both principal and student find themselves facing decisions they never wanted to make.